Lossless electricity transmission – already possible! Innovative. Forward-thinking. Dynamic. THEVA uses a unique approach to produce high temperature superconductor wire under the brand name of THEVA Pro-Line. Thanks to its outstanding performance, transporting extremely high electrical current without losses is becoming reality. This is possible due to THEVA’s over 20 years of experience in coating technology and equipment engineering. 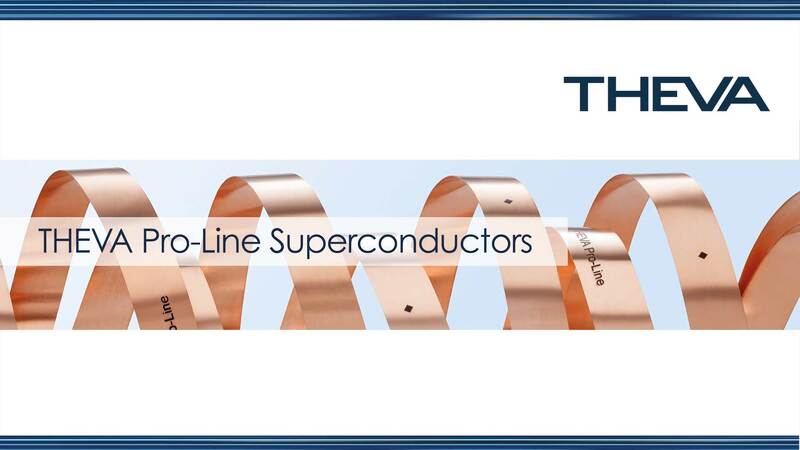 Thanks to its high-power density, our superconductor wire THEVA Pro-Line can replace copper conductors in high-performance applications and open up entirely new design perspectives. Manufacturers of cables, power electronics, industrial drives or power rails also need very reliable material that can be easily processed. We ensure that with our professional quality management. THEVA Dünnschichttechnik GmbH, based in Ismaning near Munich, was founded in 1996 and has around 60 employees today. THEVA has invested more than 15 years in the development of HTS wires. In 2012, the company decided to set up the first production line for second-generation superconductors in a commercial scale in Germany. With its headquarters in Germany and sales partners in Asia, the USA and Europe, the company is globally present for its customers. With Target Partners and BayBG, two strong investors came on board in 2012. Since 2016, eCAPITAL and Bayern Kapital have also supported the company’s growth. Since the third financing round in 2017, EnBW New Ventures joined the group of investors. Forward-looking products, increasing demand and growing markets: The perfect environment for investors. Whether in the development of wind power generators, transmitting high electrical currents in industrial processes or in the grid – the market waits for superconductors with competitive prices. Therefore, THEVA Dünnschichttechnik GmbH invested millions in the last couple of years into the first industrial production of superconductors in Germany. Five investors supported them along the way: Target Partners, Bayerische Beteiligungsgesellschaft (BayBG) as well as eCAPITAL, the growth fund of Bayern and EnBW Ventures. Are you interested in investing in our forward-looking products? If you like to contribute to THEVAs growth with your competence and capital, please contact us. Become an investor and shape the future with us!